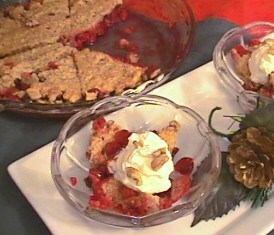 Topped with vanilla ice cream or whipped cream, this Cranberry Pie is great for Thanksgiving or any time of year! preheat the oven to 325 degrees F and spray a 10 inch deep dish pie pan with coconut oil spray. 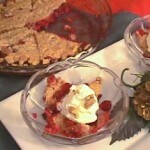 Place the rinsed and dried cranberries into the pie pan and sprinkle with ⅔ cup LC-Natural Sweet White and the chopped walnuts. Add the egg and remaining ½ cup LC-Natural Sweet to a bowl and whisk until frothy. Using a rubber spatula, fold the almond flour and salt into the frothy egg mixture and pour over the cranberries; spreading the mixture out to about ½ inch from the edge of the pie pan. (A ½ inch wide ring of cranberries around the edge of the dish should still be visible.) Bake for 40 to 45 minutes until top is golden brown, remove and let cool before slicing into 8 wedges. Serve warm. Add optional scoop of LC-Vanilla Ice Cream on top of your cranberry crisp, or top with optional homemade sugar free whipped cream blended with vanilla and LC-Natural Sweet White for the perfect whipped cream topping.